Notes: 16″ Newtonian and 8 mm Ethos ocular, 225x. West left (arrow on sketch), north down. Pluto is indicated between two vertical dashes among stars. The nebulosity is the unresolved globular cluster Palomar 8. Sagittarius. 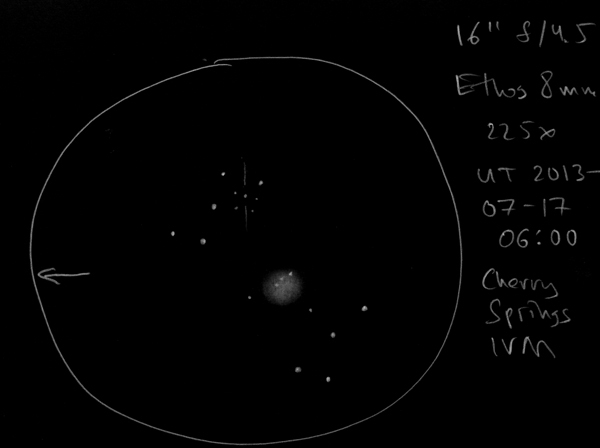 The true conjunction was around 0 UT on July 15; the observation was made around 06:00 UT on July 17. Pluto is a fascinating object that has produced much speculation and argument ever since it’s discovery by Professor Clyde W. Tombaugh (1906-1997; Lowell Observatory/New Mexico State University) on March 13, 1930 (Pluto imaged on January 23 and 29 and plates examined on February 18 by Tombaugh) at Lowell Observatory (Flagstaff, Arizona). 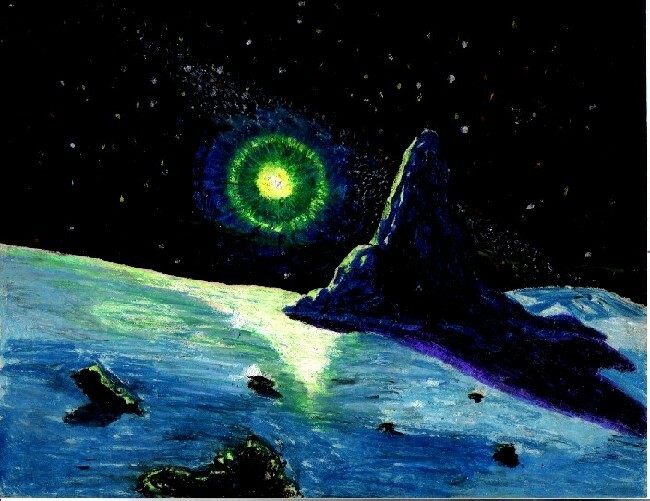 Initially believed to be the mysterious Planet X proposed by American astronomers Percival Lowell (1855-1916) and William Henry Pickering (1858-1938; also famous for his seeing scale) this far denizen of the Solar System turned out to be smaller than our own Moon (Pluto’s diameter is 1,433 miles (2,306 km) vs. the Moon (2,159 miles (3,474 km)); or 66% that of the Moon’s diameter). Even so astronomers continued to study this enigmatic body and in 1978 (June 22) its largest satellite Charon was discovered by American astronomer James Christy (United States Naval Observatory, ). Ironically Charon is over half the diameter of its parent body (Charon’s diameter is 750 miles (1,207 km) vs. Pluto (1,433 miles (2,306 km); or ~52% that of Pluto). The second largest satellite with respect to its parent body is our own Moon (2,159 miles (3,474 km) vs. earth (7,919 miles (12, 742 km); or 27% that of the Earth). Two other satellites were discovered by the Hubble Space Telescope (HST) on May 15, 2005 namely Nix (~29 miles (~46 km) diameter) and Hydra (~38 miles (~61 km) diameter). … I produced this image using Photoshop CS3 for a lecture that I gave on Pluto. The scene depicts the surface of Pluto with a thin atmosphere with Charon visible in the Plutonian sky. The Sun is brighter than in reality but I used a little artistic license. I hope that you like it.